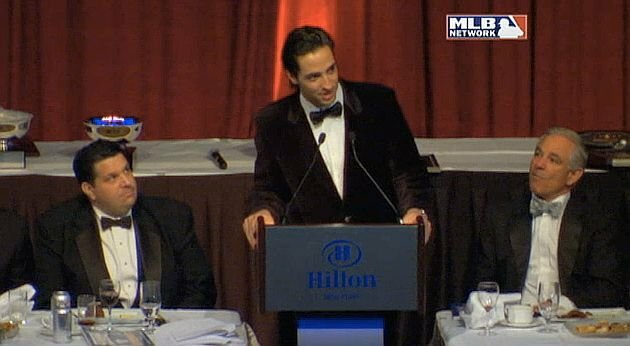 At the Baseball Writers Association of America's awards banquet last night, star Brewers left fielder Ryan Braun accepted the National League MVP award. This was Braun's first actual statement since the report of his failed drug test from December. Braun has denied that he used performance enhancing drugs and has said that the urine sample that tested positive was caused by a synthetic substance. There were talks about whether he should decline the award. He obviously did end up accepting the award but made only vague mentions of the drug test, saying that he was going to take the opportunity to grow from his challenges of late. But in a different note, he was rocking a badass velvet suit. Let's go to the videotape.